I’m already missing the beautiful green leaves and lush plants as the seasons change. Although I am quite thankful for the mild temps we’ve been enjoying, many gray days and stick trees have taken over. So this month I’m saluting the unseen green an ode to all thingsfantastically vibrant and green! 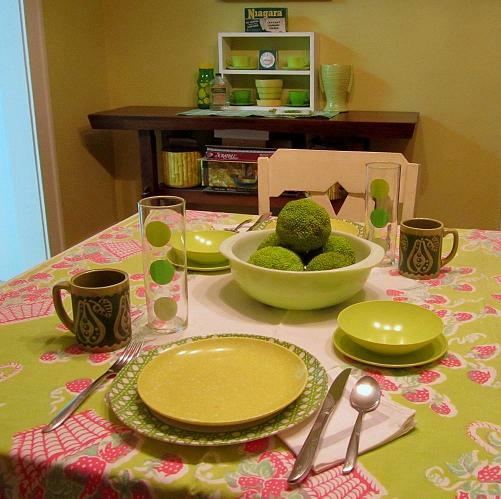 Fantastic melmac in bright shades of green are fresh and clean! I love the vintage timer which sure comes in handy. There are a couple of pieces from my grandma's. The Niagara starch and the witch hazel bottle with worn green label, and yes it still has some in it. The prizes in this vignette are the 2 McCoy pieces. A lovely ribbed vase that I can't seem to find any info on-so let me know if you've got the dirt. And also the McCoy pot which has a limey green top and a yellow base. I've never seen a two tone one and I'm wondering if it's a manufacturers defect piece where the glaze had a happy accident? Osage oranges make an interesting centerpiece in my green Pyrex bowl. More melmac of course, including the speckled chartreuse green plates on top of basketweave green-they actually have strawberries under there! 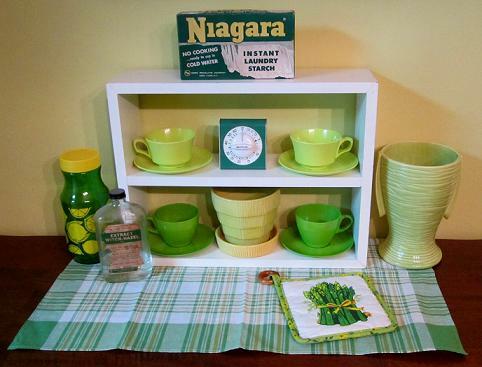 The green and pink vintage strawberry tablecloth is a fun find and those mugs made by Lefton are a personal fave. The polka dot glasses aren't vintage but fit right in! You may have noticed this happening but artgoodies is now completing the conversion of all tea towels into 100% certified organic cotton! I’m really excited about this and it’s been something I’ve been working on literally for years. Sourcing is one of the most difficult parts of business as I’m sure many of you know. The tea towels are now custom made exclusively for artgoodies to my specifications! Awesome right! They look and feel just like the towels you’ve been buying from artgoodies for years but now they are organic! Yay! And the ribbon packaging had a little green change too- they are made of recycled plastic bottles if you can believe that! SO- what does this have to do with the early bird SALE? All remaining conventional cotton stock is on SALE NOW while supplies last! You can SAVE $4 a towel folks! Click HERE and it will take you right to the SALE section in my shop! I just had an awesome trip to my local farmers market. I love the farmers market plain and simple. Don’t let the chilly weather scare you away and go to yours and stock up on some things. Support local farmers and healthy local food! 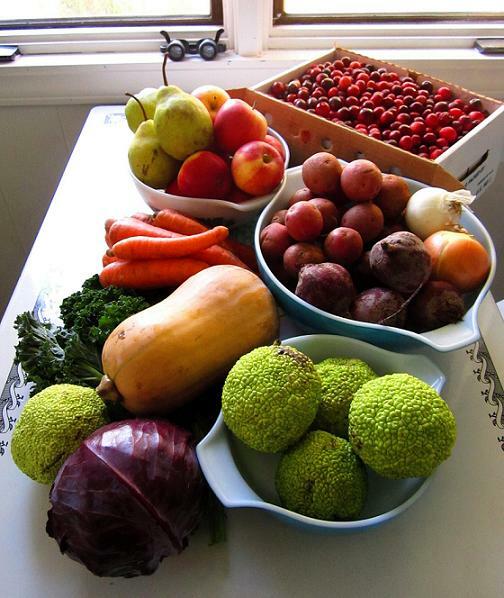 It’s going to be a long winter and you don’t want to regret not having fresh and delicious food available. So freeze it, can it, and stash those root veggies in the fridge! Think of all those awesome crock pot soups and meals you can make! Not to mention the delicious holiday meals with friends and family! Yum! I’m really excited about my new booth space here in Grand Rapids! I’ve never rented a booth anywhere before and none of the places ever really felt like a good fit until now. So for those customers who wonder if I have a store where they can shop locally, the answer is I have a small space at Lost & Found. I , of course, fell in love with all the mid century furniture they have, plus the way they style little living/dining room type spaces had me at hello. There is a shopping event there and at the other antique stores next door this Friday from 6-11:30 with wine, snacks, and plenty of vintage goodness! The new space, easy to find under the Vintagegoodies banner! 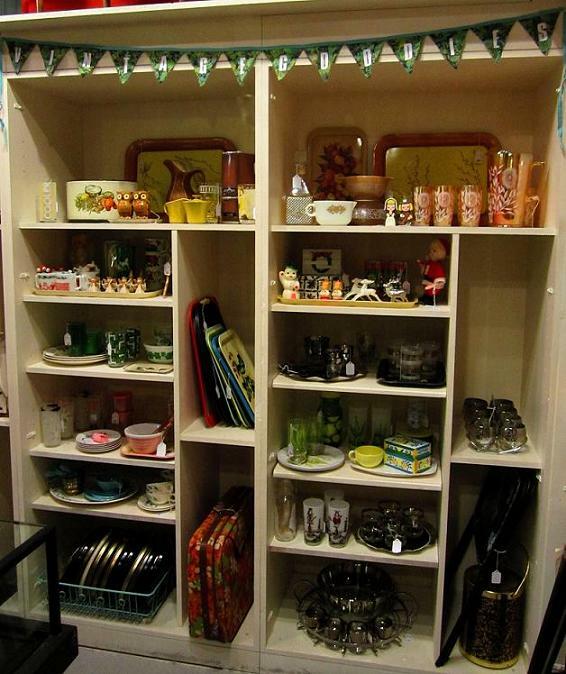 Stocked with loads of vintage housewares, vintage holiday, and mid century glassware for all your holiday party needs! Festive NEW Holiday Product! And it’s Recycled! I did a little sneak of this back in August but wanted to bring them to the forefront as the holiday sneaks up on us! 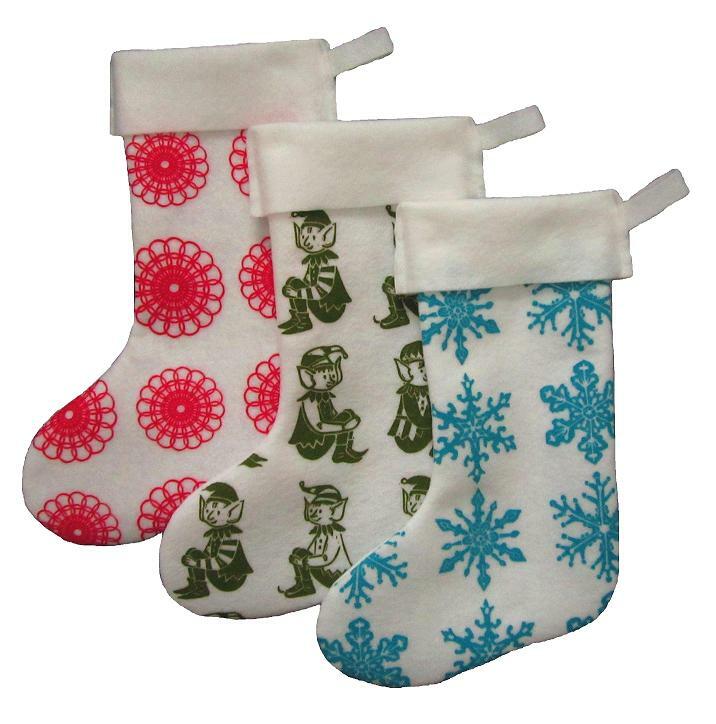 These felt stockings are made of 100% recycled plastic bottles! Awesome and there are 3 styles to choose from: elf, snowflake, and doily. Limited quantities are available and they are moving out the door quickly so make sure to grab yours before the holiday rush is on! Also on the way this week NEW holiday towels in all over elf and snowflake designs!! !